The facilitator for the 2010 West African Women and Water Training, Maame Yelbert-Obeng, has written a beautiful piece about that training for the Global Fund for Women. Learn more about what happened in February in Ghana – and prepare to dance – by clicking here. Read WEA's Call for Action on Mother’s Day, which was posted on Care2. And we invite you to join our mailing list! Click here. The following article has been written by Carolyn Raffensperger, Executive Director of the Science and Environmental Health Network. What is sacred? What does the law recognize as sacred? These were the questions that haunted me yesterday, the third full day of the delegation’s trip to Nevada and Arizona to join with indigenous people to protect sacred sites from defilement and desecration. The mine is one of the stand-by projects of Dennison. The corporation is awaiting the price of uranium to go up and the boom of nuclear power to resume. 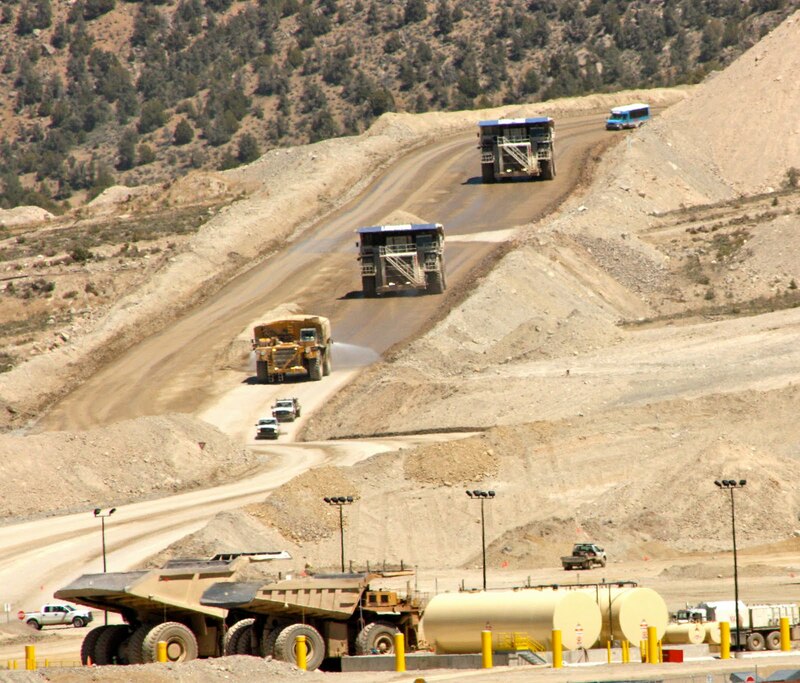 Dennison, according to its website, “enjoys a global portfolio of world-class exploration projects…” The problem is that the neighbors of the mine, in this case Navajo and Havasupai do not enjoy the exploration or the mining. The legacy of uranium mining in the Southwest is grievous. Cancer, contaminated land, and water are the consequences of six decades of a nuclear weapons program and nuclear power. Indigenous people bear the brunt of the environmental problems associated with uranium mining. This is personal for me. One of my dearest friends, an indigenous woman, grew up playing in the mine tailings near Tuba City AZ. Monday she had surgery for her third cancer. She is in her 30s. The mining official we met with yesterday argued that the uranium miners’ high cancer rate was caused by their smoking rather than the radioactivity associated with the radon in the mines or the uranium itself. The old argument that most cancers are a result of lifestyle “choices” is increasingly discredited by science. Just today the President’s Cancer Panel, a distinguished group of scientists issued a new report on environmental causes of cancer. Radon is fingered as one of the culprit carcinogens. The tribes consider this land to be sacred. There are springs and mountains, canyons and buttes that hold the religion, the stories and the histories of these people. It is the relationship of a community of humans to a place that makes that place sacred. Yet U.S. law only recognizes religion, which amounts to beliefs held by individuals. Indigenous spirituality is made up of the web of exquisitely-tended relationships that manifest and express beliefs. The question of what is sacred sometimes only surfaces when we see what has been defiled--the rage we feel when we think a cancer might have been prevented, or an ocean might not have been polluted. How could we contaminate the very land from which we live? How can we contaminate the bodies of our children? How can we defile the places where we bury the dead? How can we destroy the places of great beauty and much history? All of these are sacred. We know this in our hearts. Below is the lively conversation among WEA Co-Directors, Amira and Melinda. Pass this along to others for a dose of inspiration! Britt Bravo, a blogger and consultant, interviewed Melinda and Amira for her Big Vision podcast series. She posted the interview to her blog and to BlogHer. The following article has been written by Sarah Diefendorf, Executive Director of the Environmental Finance Center at Dominican University and member of the Women’s Earth Alliance delegation to threatened Native American sacred spaces in Nevada and Arizona. What is gold wor th? In the current economy when all investments are questionable, gold has proven its superior position once again, rising to the top of the charts at about $1,170/oz on the winds of depression popularity. Gold is the color of choice for musical artists making their statement, for brides proving their wealth on their fingers and for the low income rank and file who hopes, some day, that he can be anything but. For too many, gold is so much more than a piece of metal, it is who you are, who you hope to be and what you dream you could become. So what is gold worth to you? Have you ever stopped to think about where that shining emblem of rank began its life? Have you ever wondered about the journey of your jewelry, where it began, what deadly chemicals it grasped in order to be leached from the earth, and who it harmed along the way? Somewhere out in the Nevada high desert in the United States of America, a leach heap of rock and gravel is being sprayed with water and cyanide so that microscopic bits of gold will adhere to this favored poison and bleed into a pond where it will be collected and sent to a roaster to be processed for the market. Somewhere, maybe right now, because mines are 24/7, a siren is sounding long, loud and hard to signal a blasting zone, deep within a sacred mountain that has been raked and ripped apart by our thirst for status. So does this matter to you? This dry place tucked in amongst the sage, where almost no one lives and no one from the federal to the state to the local government seems to mind that mostly foreign companies are staking out virtually free claims for massive profit – should you care? This is why you should. The American west is your heritage; it is saturated with our expansive history and is the very symbol of who we are to ourselves and the world. Nevada was the crossroads of this history of ranchers, cowboys, miners and Indians, and to this day it still is. Nevada remains the Wild West, and true that image, it is pressing its Indian population on to ever smaller lands, confiscating their horses and cattle, and desecrating their sacred sites, all in the name of gold. As a result, the Western Shoshone are still fighting the battles that most Americans associate with a distant past, highlighted on black and white film. Thanks to an outdated mining law established in 1872, major international corporations can stake their claim, pay virtually nothing and take the land – Shoshone land – with almost no oversight and with the full sanction of the US government. So yesterday, May 3, 2010, we bore witness to one site at the base of Mt. Tenabo, praised as sacred by the Shoshone, but deemed a golden windfall by Barrick Inc. Now home to the world’s third largest gold mine, Mt Tenabo is being ripped apart and dug asunder while you read these words. Their holy, centuries-old gathering site, is gone, 1,000 trees cut down, tunnels blown out of the mountainside. 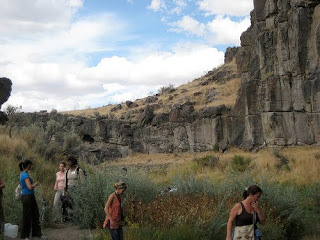 The mountain holds the spirit of the Western Shoshone people who have occupied this land for thousands of years. The microscopic gold will be extracted through a process using mercury and cyanide by a major international Canadian corporation, leaving a legacy of toxic waste in a mountain of rubble. The Shoshone belie ve that gold is a conductor, not of electricity but of our earthly spirit to the spirits of our ancestors. When the gold is cut out of Mt Tenabo, the spirits will be killed, the mountain will be gone, and another bridge from their ancient past to their uncertain future will be forever burned. If you’re lucky enough to listen and learn from an elder, you might hear about the life of Mt Tenabo: how the mountain is the mother of the Shoshone, that all life began there and all those who pass will return to her womb. The mountain is equivalent to their Jerusalem, their Temple on the Mount, their Mecca. It is as real to them as our shrines and holy cities are to us. Yet the United States Government has seen fit, in 2010, to allow the desecration and destruction of this holy site. So what is gold worth to you? Think about it. Is gold worth the destruction of your church, temple or mosque? Would you allow the site of the birth of your holy truth to be turned over to be mined for profit? What is gold worth to you? The next time you visit your jeweler ask him where the gold came from, how it was mined and what damage it caused along its path, and decide for yourself if the journey was worth your purchase. And in the end, if he can’t answer your questions, if the path has been hidden from your view, leave the gold on the table and maybe more will be left in the earth. As I write this, the WEA Advocacy Delegation is en route from Elko, NV to Flagstaff, AZ. We spent a remarkable and deeply moving day yesterday with Carrie Dann, Western Shoshone elder and long-time land rights activist, as well as Julie Cavanaugh-Bill, the trailblazing attorney for the Western Shoshone Defense Project. Carrie, along with her nephew and Julie’s husband Larson, brought us to Mt. 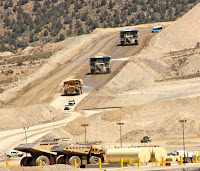 Tenabo – a place that is fundamental to the Shoshone creation story, and is also the site of the largest open pit cyanide heap leach gold mine in the United States. We saw and felt the impact of this devastating and ever-expanding mine on the Western Shoshone people, the living land, and the unborn future generations. Moreover, laws like the 1872 Mining Law support activities that affirmatively harm communities and land. This law was written in the time when people mined using picks and shovels, long before environmental regulation -- so today, it essentially allows mining companies free reign to extract with impunity. 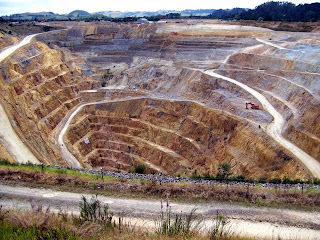 And we heard from Carrie and Larson that when protective laws do exist, mining companies usually find a way around them. This circle of allies continues to grow and strengthen. Join us in spreading the word! Five incredible women stepped off the plane this morning in Elko, Nevada, welcomed by a blue sky, expansive landscape and the snowcapped Ruby Mountain range. Each of these women is a dynamic leader in environmental law, policy and business – ranging from years of dedicated environmental litigation practice, to visionary policy work, to innovation in business. Each woman brings her own unique style and perspective, and yet all have in common a fierce love for the earth, and a passionate determination to promote justice for all peoples. These women – Lauralee Barbaria, Director of the Green MBA program at Dominican University; Sarah Diefendorf, Director of the Environmental Finance Center Region IX; Carolyn Raffensperger, Executive Director of the Science and Environmental Health Network; Janet Wallace, author and longtime environmental attorney; and Ann Winterman, human rights advocate – along with the Women’s Earth Alliance team, are our traveling community for the next week. We have come on this Delegation, Defending Sacred Places in the Southwest, to learn, build relationships with indigenous women leading environmental justice campaigns, and become empowered as advocates. We are here to witness, and work towards the eradication of, grave environmental injustice and human rights violations on indigenous lands.
. . . Western Shoshone lands are the third largest gold producing area in the world, and because Nevada’s gold mines create 86% of the nation’s total toxic mercury waste.
. . . The San Francisco Peaks are the holiest of shrines for Navajo, and threatened contamination renders the people unable to maintain daily and annual religious practices comprising an entire way of life.
. . . In some Northern Arizona Native communities, at least one member of every family is thought to have died from cancer or other diseases caused by uranium mining. And we are here because women -- as community caregivers, resource stewards, and guardians of future generations -- stand at the forefront of every single one of these crises, demanding change and calling forth alternative systems and ways of being. Over the course of this week, we will explore the tension between our shared system of laws and policies which allows, and even condones, the exploitation of indigenous lands and communities in the name of fossil fuels, with the system of L.A.W.S. – land, air, water, sun – that indigenous peoples know a society must respect in order to live in harmony and prosperity. Through inquiry, listening, and community-building, we will form a new understanding of our role in transforming systems to support life and ensure justice. Check back in tomorrow, for a report from Janet Wallace about our time with the Western Shoshone leaders as they work to protect holy Mt. Tenabo from the largest open pit heap leach cyanide gold mine in the United States. Thank you for coming along!